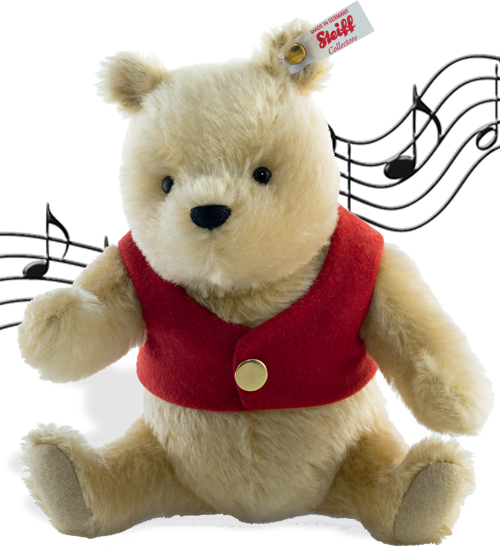 "Plays famous 'Winnie the Pooh' melody"
Steiff MUSICAL WINNIE THE POOH - a teddy bear always loved by our collectors - and plays the charming melody 'Winnie the Pooh'! One of the worlds loved bears! A wonderful gift for a special event, birthday or superb Christmas gift - this Steiff bear will be adored for years and years and years! He is made from the finest blond mohair and is 3-way jointed - his head is turnable and arms moveable. Bright shiny eyes, hand embroidered black mouth, felt paw pads and little eyes on his famous head. He is wearing his famous red waistcoat with bright button and just turn his music box key on his back and he will play his famous melodie - Winnie the Pooh. 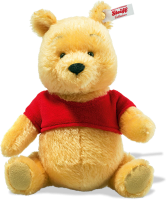 How exciting - a present for all our Pooh lovers. Limited edition of just 2,000 pieces made.